Is there a more wretched style of music than smooth jazz? We all know it when we hear it; there’s a good bet it will feature an insipid melody, usually played on soprano sax or clean-toned guitar, a dollop of white-man’s-overbite funk and usually a side order of cheesy slap bass too. When the intricate, interesting jazz/rock played by the likes of Weather Report, Steps Ahead, Miles Davis and John McLaughlin started tanking in the mid-’80s, artists such as Bob James, The Rippingtons and Spyro Gyra took the classic fusion sound, sweetened it, added touches of light gospel and soul and repackaged it as yuppiefied, post-Windham Hill chill-out music, jazz for people who hate jazz. And they made a killing. But a different kind of ‘smooth jazz’ had emerged a decade before, in the late ’70s and early ’80s, a mixture of AOR, jazz harmony, classic fusion and Yacht Rock. It was the soundtrack for driving West on Sunset, decadent, expensive-sounding music full of dreamy Fender Rhodes playing and tasty grooves. Musicians and arrangers such as Johnny Mandel, Jerry Hey, Tom Scott, Jeff Porcaro, Larry Carlton, Abraham Laboriel, Quincy Jones, George Benson, David Sanborn, Harvey Mason, Jay Graydon and David Foster thrived in this era when state-of-the-art production fused with jazz-tinged songwriting to create the missing link between Steely Dan and Earth, Wind & Fire. The unofficial headquarters of the sound was The Baked Potato, a nightclub in Studio City, LA, and one of the key musicians was guitarist Lee Ritenour (ironically one of the figureheads of the late-’80s Smooth Jazz scene proper). His 1981 album Rit is a classic of its kind alongside George Benson’s Give Me The Night, Larry Carlton’s Friends, David Sanborn’s Hideaway, Casino Lights, Randy Crawford’s Secret Combination and Steely’s Gaucho. Drum fans will enjoy Rit too; the great Jeff Porcaro plays a blinding shuffle on ‘Mr Briefcase’ (another pop hit from the album) and produces a classic rock performance on ‘Good Question’. According to Wikipedia, MTV broadcast the videos of ‘Mr Briefcase’ and ‘Is It You’ during its first day on air (1st August 1981)! 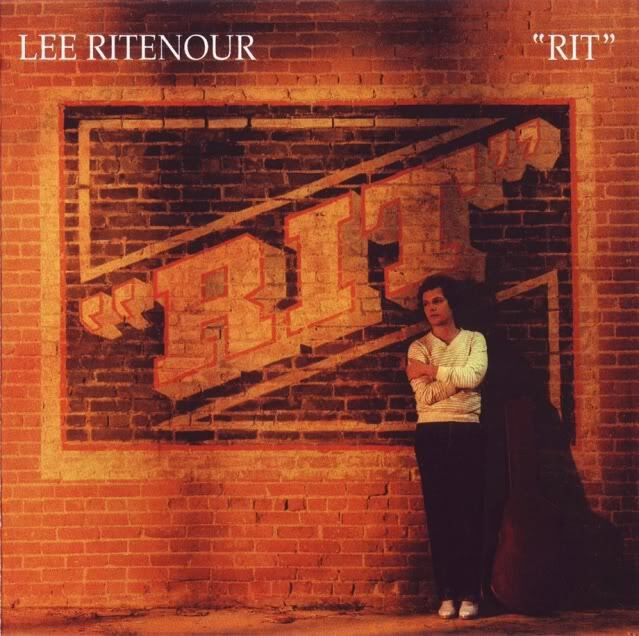 When things get too mellow, Ritenour always seems to know when to insert a spicy solo (in the days when he delivered high-octane jazz/rock playing a la Santana or Larry Carlton). The instrumentals are an appealing mixture of early ’80s technology (Linn LM-1 abundant) and the sparky funk of Abe Laboriel’s bass playing and Don Grusin’s soulful Fender Rhodes. And Jerry Hey’s horn arrangements are instantly recognisable and a great addition. I don’t think it’s an exaggeration to say that Rit was an influence on Thriller (compare Rit’s ‘Just Tell Me Pretty Lies‘ with Jacko’s ‘Baby Be Mine‘) and various other Quincy productions later in the decade. In 1982, Ritenour released the sequel Rit 2, which was almost as good and contained the superb ‘Roadrunner’. These are a couple of albums well worth revisiting. This entry was posted in 1981, Album Reviews, Fusion, Jazz/Funk, Lee Ritenour, Rock and tagged davidfoster, erictagg, harveymason, jeffporcaro, knightrider, leeritenour, quincyjones, rit, smoothjazz, yachtrock. Bookmark the permalink. Matt, I have to say that I’ve always loved that “dreamy Fender Rhodes playing” from back then. You can also hear it on the classic “Street Life” by The Crusaders. That’s a truly wonderful sound and very much of its time and place. At least I’ve always thought so. I know exactly what you mean. I love that creamy, slightly phased Rhodes sound too. Lonnie Liston Smith also used it a lot in the early ’80s.